Antisemitism and anti-Zionism are complex, delineable, yet inter-related social-psychological phenomena. While antisemitism has been described as an irrational, age-old prejudice, anti-Zionism is often represented as a legitimate response to a ’rogue state’. Drawing upon media and visual sources and rich interview data from Iran, Britain and Israel, Antisemitism and Anti-Zionism: Representation, Cognition and Everyday Talk examines the concepts of antisemitism and anti-Zionism, tracing their evolution and inter-relations, and considering the distinct ways in which they are manifested, and responded to, by Muslim and Jewish communities in Iran, Britain and Israel. 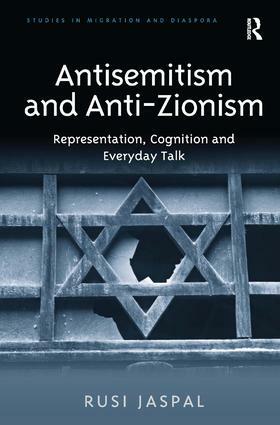 Providing insights from social psychology, sociology and history, this interdisciplinary analysis sheds light on the pivotal role of the media, social representations and identity processes in shaping antisemitism and anti-Zionism. As such, this provocative book will be of interest to social scientists working on antisemitism, race and ethnicity, political sociology and political science, media studies and Middle Eastern politics. Rusi Jaspal is a Chartered Psychologist and Senior Lecturer in Psychology in the School of Applied Social Sciences at De Montfort University, Leicester, UK.